On Thursday, our two U13 teams trained together for the first time since we split the teams up. We mixed the boys together on two teams and let them play. We used the session to gently guide their way to proper shape and positioning and keep the ball moving. But one thing was painfully obvious, we have to get our boys a game to get them back into soccer mode. They've done well training this much, but they are young and a game would pick them up and get the intensity back into training. Soccer purists will tell you it's very important to train a lot, and they're right. But young players also want to play and it's good for the coach to perform a diagnostic type of evaluation to determine the path of the next set of training sessions. We have two more training sessions before the boys head out on March break. My intention is to have the proper registration complete so we can have some indoor competition and get one or two games under our belts. We are also working with boys who are at the end of their winter sport seasons and we have to be conscious of that. Hockey and basketball playoffs are underway so their training schedules have ramped up accordingly. I am trying to keep what's going on in mind and trying to stay positive with the boys. I do get short with them on occasion when they are not focused during technical work and I need to work on that. I always try to provide as much useful information as I can, but I like technical work to be done correctly and the loosy-goosy attitudes can come out in the small sided games. The season is still a few months away so the coaches have to ensure we ramp up the intensity accordingly. Tonight after our U13 session I ran an hour of the U10/U11 group. The U11 group was missing their coach and were to train with the U10 group. The U10 group had their parent meeting tonight so the call came. I wasn't sure what to expect as I have never worked with either group. There were 21 players in total. I set up a 25x25 grid, 10 players on the inside with a ball each and 11 players around the perimeter of the grid. The players on the inside find an open player on the outside, pass and take their place. The player receiving the ball makes a long first touch into the grid and seeks another player on the perimeter to pass to and take his place. 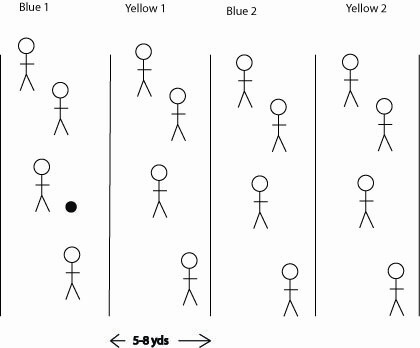 Communication between passer and receiver (verbal, visual). Players around perimeter checking out and in, attacking the ball. Players in the grid make the pass when the pass is on, no extra touches. We then progressed to dividing players into 2 teams and you were only allowed to pass to player on your team, no forcing them to locate teammates. Same coaching points. We then progressed to having only 3 players of each team in the grid and the rest on the perimeter. With that setup there was only one ball and they were playing possession. When you used a support player from the perimeter you took their place and they came into play. 5 consecutive passes gets the other team 5 push-ups. I then progressed it to a 6v6 game before the coaches took over again. The only condition I put on the game was no on touch play (blindly striking the ball). The session was very enjoyable for me and the kids were great. I hope to see them again soon. Tonight we ran a field size passing drill again that involved a lot of passing, receiving and dribbling. the boys kept moving and worked well enough. I was stressing the receiving tonight. One of the most important coaching points when receiving the ball is to attack the ball, moving towards it so your feet are already moving. You significantly increase your success rate when receiving a ball with active feet. We worked on receiving the ball with the inside and outside of the foot as well as letting it go through your legs and playing it behind you. When you get beat 1v1 work hard to win the ball back. When you win the 1v1 accelerate as he is most likely going to be coming to win the ball back. A small roster size hurt training again as we had 4 of our regulars missing (broken toe, flu, indoor league and ski trip). Three players from our other U13 team were there and were great to have out. We have to work on improving the speed at which our passes are played. The boys are improving with their decisions and getting a little more creative in games, but there has to be more of a threat in their passing. For our next session we are with all the players on both teams, then back to separate sessions again. I made a bold move tonight. We were short players near the end as some had to leave early for hockey, so the coach jumped into the game ... and got schooled by his own son. A friend of mine, Stuart Neely, has coached at the international level and been involved with the youth academies of three different professional clubs. He said something to me once that never escaped me but I didn't realize how important it was until this past Monday night. His words were "anybody serious about coaching should always stay involved with the youngest players in some capacity". His meaning was that you can sometimes get led away from the very basics of coaching when you move up levels and these young players bring you right back to square one, probably the most important place to be as a coach. Over the past 5 weeks I've been working with a clinic for players U8-10. I have to admit I was struggling with the lesser experienced U8 players and some in that group are very very raw. Two weeks ago I felt I made some progress and last night I walked off the field feeling good. During our warm-up and functional portion I felt they were really starting to understand what we were doing (dribbling and turns). We got into 1v1 games and that showed more progress and the 6v6 game at the end told me they were catching on (with more work to do). It's a funny relationship with younger players. Not only can you feel yourself getting frustrated with their progress, you can feel the players getting frustrated with you at times. 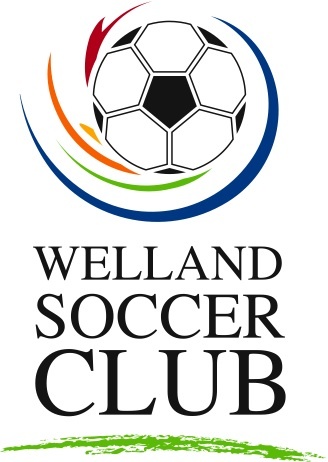 The gentleman helping me , Coach Nilan, is helping with the Welland U9 boys this summer and I was glad he made this journey with me, to appreciate the work and persistence involved in coaching younger players. Today with the U17 boys we reviewed defending. Because it was a review, we piled 1v1 , a functional exercise and a small game into the same 90 minute session. We are not training that often yet and most of these boys play High School soccer, so we want to give them as much info as possible to take back to their school sessions. We reviewed some different scenarios during the drill but kept it basic and informative. It's interesting to see how some players give up so easily when they are beat, yet others will run over their grandmother to get the ball back. It was new for some of them to be told that they need to take off and attack once they win the ball. We all see it, a team wins the ball and holds it instead of looking for a counter attack. Then we set up a playing area with 4 lanes roughly 7x25yds each. The diagram at the right shows 8v8 but we only had 12 players today and put 3 players in each lane. I always adjust the lanes according to age and # players. 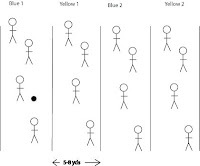 The goal of the game is to move the ball to your teammates of the same colour in the other lane. So Blue 1 to Blue 2, Yellow 1 to Yellow 2. The opposing players between the lanes are trying to prevent you from putting the ball through and if they intercept it, they try to connect with teammates in the other lane. This game can be used to work on so many different things: possession, defending, counter attacking mentality, etc. Today I used it for defending. Before you progress, all players must stay in their own lane. Lots of movement and co-operation between players on the defending team. You do not want players chasing the attacking teams' passes. Instead a defensive support player moves up to pressure and original defender drops and tucks behind the pressure guy to take away forward progress. If you chase the ball sideways and a teammate steps up to pressure you temporarily create a situation where you are square and vulnerable to a pass splitting the two of you. Once the game was moving and we were happy with the movement we progressed it to where a player on the defensive team can step into the other lane to apply more pressure on the ball. Only one defensive player can enter the lane at a time. I was happy with their work rate and intensity today. These boys are older and competitive so when a training session is going well it's a lot of fun. The number of players made it difficult to keep the pace of the final game at a good level so we took a few breaks to review. We also put off-sides into the game as well as saying it would be 2/3 height pressure on the ball (no pressuring ball in attacking third of the field). I did not stop the game at all to coach as they were enjoying themselves and adhering to the theme of the day.